The inter-relationship between various significant ancient versions and recensions of the Old Testament (some identified by their siglum). LXX here denotes the original septuagint. Hexapla (Ancient Greek: Ἑξαπλᾶ, "sixfold") is the term for a critical edition of the Hebrew Bible in six versions, four of them translated into Greek, preserved only in fragments. It was an immense and complex word-for-word comparison of the original Hebrew Scriptures with the Greek Septuagint translation and with other Greek translations. The term especially and generally applies to the edition of the Old Testament compiled by the theologian and scholar Origen, sometime before the year 240 CE. The subsisting fragments of partial copies have been collected in several editions, for example that of Frederick Field (1875) being the most fundamental on the basis of Greek and Syrian testimonies. The surviving fragments are now being re-published (with additional materials discovered since Field's edition) by an international group of Septuagint scholars. This work is being carried out as The Hexapla Project  under the auspices of the International Organization for Septuagint and Cognate Studies, and directed by Peter J. Gentry (Southern Baptist Theological Seminary), Alison G. Salvesen (Oxford University), and Bas ter Haar Romeny (Leiden University). The purpose of compiling the Hexapla is disputed. Most likely, the book was intended for the Christian-rabbinic polemic regarding the corruption of the text of Scripture. The codex included the Hebrew text, its vowels in Greek transcription and at least four parallel Greek translations, including the Septuagint; in this respect, it is a prototype of the later polyglot. A number of sources say that for the Psalter there were two or three versions of the translation, as for some prophetic books. At the end of his life, Origen created an abbreviated version of his work - the Tetrapla, which included only four Greek translations (hence the name). Origen's eclectic recension of the Septuagint had a significant influence on the Old Testament text in several important manuscripts, such as the Codex Sinaiticus. The original work, which is said to have had about 6000 pages (3000 parchment sheets) in 15 volumes and which probably only ever existed in a single complete copy, seems to have been stored in the library of the bishops of Caesarea for some centuries, but it was destroyed during the Muslim invasion of the year 638 at the latest. In the 5th century the Septuagint in the edition of Origen was rewritten from the Hexapla, while the scientific apparatus of Origen in this copy was ignored. This version of the Septuagint was widely spread in Palestine. At the beginning of the 7th century, Bishop Paul of Tella translated this text into Syriac, preserving the editorial letters of Origen (the so-called Siro-Hexapla); it is one of the main sources of reconstruction of the original. When the conquest of Caesarea by the Arabs in 638 (or 653), the work of Origen probably was lost. In 1896-1900, fragments of the Psalter from the Hexapla were discovered in the Cairo Geniza. Attempts to publish the text of Origen have been made since the 16th century. (...) due to discrepancies between the manuscripts of the Old Testament, with God's help, we were able to overcome using the testimony of other editions. This is because these points in the Septuagint, which because of discrepancies found in [other] manuscripts had given occasion for doubt, we have evaluated on the basis of these other editions, and marked with an obelus those places that were missing in the Hebrew text [...] while others have added the asterisk sign where it was apparent that the lessons were not found in the Septuagint; we have added the other, consistent with the text of the Hebrew editions. For Origen, as follows from the message to Africanus, it was unthinkable to offer his own, more correct in his opinion, translation of Scripture, both because of doubts about the degree of proficiency in the language, and because he considered such a task impious. In the same epistle, he defended the Septuagint's text before the Proto-Masoretic, because he received the approval of the Church Fathers, and trying to revise it meant also playing in favor of the opponents of the Christian Scriptures from the rabbinic environment. These same reasons prevented him from taking any other translation, except the Septuagint; but Origen taught that Christians should openly declare discrepancies between the text of the Septuagint and the Hebrew. Apparently, this was the primary reason for collecting all existing Greek translations of the Old Testament Scriptures and rewriting them in parallel columns, noting in the Septuagint text all the discrepancies with the original. In total, Origen spent 28 years compiling his work. The discussion about his motivations and reasons is not finished to this day. The traditional point of view, most prominently argued by A. Rahlfs, says that Origen sought to correct the Septuagint in the proto-Masoretic text in order to deprive the Jews of the argument about the "depravity of Scripture" in the controversy with Christians, while for the scientist the main criterion was not the Septuagint, but the original. A similar point of view was expressed by F. Schaff, who, however, attributed Origen the goals of the Septuagint apology, which should be cleared of the distortions of copyists and protected from accusations of inaccuracy. I.S. Vevyurko cited the following counterarguments: indeed, Origen corrected the text of the Septuagint, but noted all the changes introduced by special signs, once worked by Alexandrian philologists for textual criticism. Other translations served Origen primarily as evidence to record the understanding of the original. In other words, the scientist was looking for variants recognized by all witnesses of the text; and did not seek to eliminate all additional readings. According to modern biblical scholars E. Camesar and T. Low (2008), Origen sought to increase the exegetical possibilities of the Greek text. The order of the columns does not correspond to the chronology of their creation. Epiphanius of Salamis wrote that the standard of accuracy of the biblical text for Origen was the Septuagint, which contradicts his own judgments. In modern biblical studies, it is commonly believed that the logic of the arrangement of translations is explained by their connection with the Hebrew text. According to Henry Barclay Swete, Aquila presented the most literal translation, later revised by Simmachus, just as Theodotion followed the Septuagint and tried to revise their text. I. S. Vevyurko (2013) affirm, Aquila and Symmach were directly translated from Hebrew, while Theodotion was perceived as a editor of the Septuagint. At the end of his life Origen prepared a separate work called Tetrapla — a synoptic set of four Greek translations, placing the Septuagint alongside the translations of Symmachus, Aquila and Theodotion.. Both Hexapla and Tetrapla are found in Greek manuscripts of the Septuagint, as well as the manuscripts of the Syro-hexaplar_version. However, in a number of cases, the names of "Hexapla" and "Octapla" (in the Book of Job of the manuscripts of the Syro-Hexapla and the hexaplar Psalms) are also applied to the work of Origen. This caused a discussion in its time about whether these were separate works. Eusebius of Caesarea mentions that the Psalter in the Hexapla was supplemented by three anonymous translations - Quinta, Sextus and Septima. According to Eusebius of Caesarea, the Hexapla contained three more translations of the Greek Psalms (Quinta, Sexta and Septima), which, however, have not been preserved (for a total of 9 columns, so-called. Enneapla). The Hexapla had approximately 50 volumes and was stored in the Library of Caesarea. It has never been rewritten in its entirety. The original was probably lost with the destruction of the library in AD 638. According to Epiphanius, the original Hexapla compiled by Origen had a total of eight columns and included two other anonymous Greek translations, one of which was discovered in wine jars in Jericho during the reign of Caracalla. The so-called "fifth" and "sixth editions" were two other Greek translations supposedly discovered by students outside the towns of Jericho and Nicopolis: these were later added by Origen to his Hexapla to make the Octapla. According to A. Cruzel (1992), Origen never tried to "determine" his theological thought and was completely dependent on the biblical text, which he followed in his comments step by step, so his own theology was a matter of exegesis. The basis of his exegetical activity was a deep conviction that the whole Bible contains meanings besides direct reading, which was the basis for his condemnation by Epiphany of Cyprus and Vikentiy Lirinsky. In 1900, Charles Taylor published a severely damaged fragment of a palimpsest, originating from the Cairo Geniza. 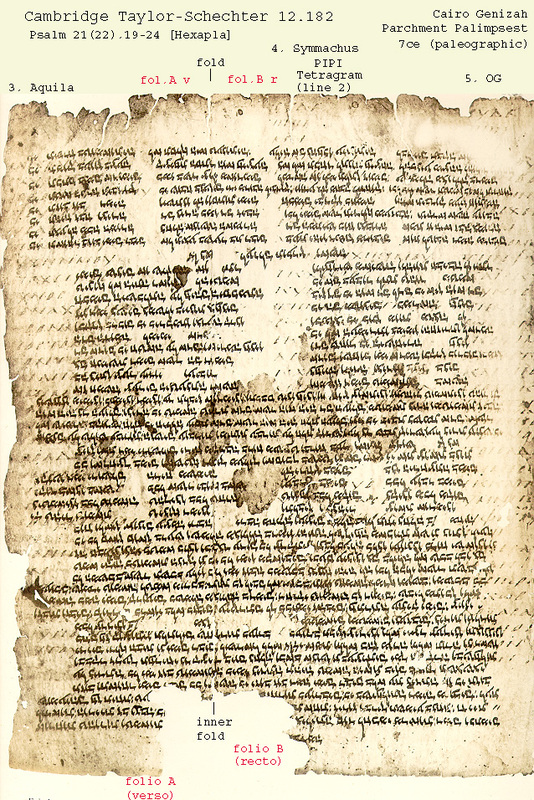 The text had at least three layers: under the early medieval Hebrew records, a late-antique liturgical poem and the unidentified Hexapla text of about the eighth century were seen: the vocalization of the Psalm 22 by Greek letters and fragments of translation: Aquila, Symmachus, Septuagint and Theodotion - in that order. Taylor suggested that initially the text on the sheet was rewritten in 40 lines (33 preserved), and on each of them the Greek equivalents of the corresponding Hebrew words were accurately placed. In 1994, R. Jenkins re-examined a fragment of the Hexapla sheet and confirmed that the original text was rewritten in 40 lines, assuming that the Hebrew text was not copied in a square letter in this manuscript. Main article: Ambrosiano O 39 sup. 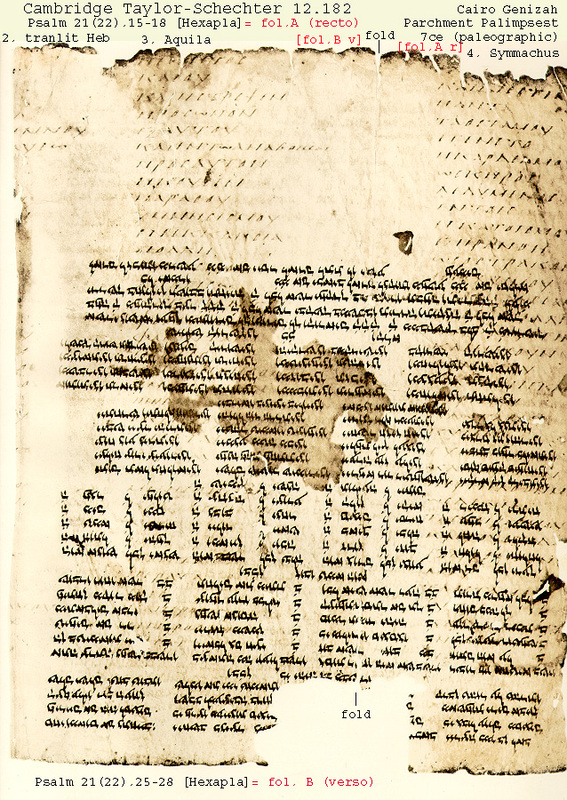 Even earlier - in 1896 - Giovanni Mercati announced the discovery of the hexaplaric text of the Psalter in the Greek palimpsest [approximately] from the 13th-14th century from the Ambrosian library. However, this fragment (44 pages) was published only in 1958 and included ten psalms. It turned out that according to the peculiarities of the minuscule handwriting the text could not have been rewritten before the 9th century, while in the original manuscript there were five variants of the text in parallel columns versus six in the fragment from the Cairo genizah. They are related by the order of the texts - Greek transliteration, Aquila, Symmachus, Septuagint and Theodotion; The Hebrew text was never a square letter in this manuscript. The manuscript was intended, apparently, for exegetical needs, and each version of the text of the Psalms was accompanied by patristic commentaries. Apparently, it was a very voluminous and expensive manuscript. According to E. Grafton and M. Williams, these fragments allow us to shed some light on some features of the original Hexapla. In particular, the text in the columns of both the Milan and Cairo fragments is a line in a line, so that one Greek word exactly corresponds to one Greek word. At the same time, according to Grafton and Williams, the Hexapla could not have been a single codex, but rather an entire library - a series of uniform codices of fixed volume and large format (the Cairo fragment allows us to judge this). Assuming that the Hexapla original was rewritten by an official of 40 lines per sheet, and each column had only one Hebrew and Greek word, the volume could reach 40 volumes of 800 pages (400 sheets) in each. Its cost could be compared with the expenses of the diocese to help the poor, which in Rome under the Pope Cornelius reached 6 million denarius per year. E. Grafton and M. Williams, based on the textual evidence and analysis of ancient sources that tell of Hexapla, suggested that the Tetrapla was preceded by Hexapla. Origen could begin work on the comparison of Greek translations even in Alexandria (even with the Greek vowel of the Hebrew text) and added the first - a Jewish - column, already in Palestine and becoming close to the local Jewish and Judeo-Christian environment. Since the beginning of the fourth century the Septuagint began to be rewritten in the version of Origen. G. Thackeray stated that the elimination of hexaplaric interpolations is the most important task of the Septuagint textualism. ^ Trigg, Joseoph W. - Origen - The Early Church Fathers - 1998, Routledge, London and New York, page 16. Retrieved 31 August 2015. ^ Origen, Commentary on the Gospel according to Matthew, K. Augustyniak, Kraków: WAM 1998, p. 246. ^ Würthwein, E. (1987). Der Text des Alten Testaments. Stuttgart: Deutsche Bibelgesellschaft. p. 66. ^ Cave, Wm. A complete history of the lives, acts, and martyrdoms of the holy apostles, and the two evangelists, St. Mark and Luke, Vol. II. Wiatt (Philadelphia), 1810. Accessed 6 Feb 2013. Felix Albrecht: Art. Hexapla of Origen, in: The Encyclopedia of the Bible and Its Reception 11, Berlin et al. 2015, cols. 1000-1002. Alison Salvesen (Hrsg. ): Origen's hexapla and fragments. Papers presented at the Rich Seminar on the Hexapla, Oxford Centre for Hebrew and Jewish Studies, 25th July – 3rd August 1994 (= Texts and studies in ancient Judaism. Bd. 58). Mohr Siebeck, Tübingen 1998, ISBN 3-16-146575-X. Erich Klostermann: Analecta zur Septuaginta, Hexapla und Patristik. Deichert, Leipzig 1895. Frederick Field (ed. ): Origenis hexaplorum quae supersunt: sive veterum interpretum Graecorum in totum vetus testamentum fragmenta. Post Flaminium nobilium, Drusium, et Montefalconium, adhibita etiam versione Syro-Hexaplari. 2 vols. Clarendonianus, Oxford 1875 (vol. 1: Genesis – Esther. Hexapla at the Internet Archive; vol. 2: Hiob – Maleachi. Hexapla at the Internet Archive). Herbermann, Charles, ed. (1913). "Hexapla" . Catholic Encyclopedia. New York: Robert Appleton Company. Jewish Encyclopedia: Origen: His "Hexapla"
John Johnson, Hexapla from the Lexham Bible Dictionary, 2013.